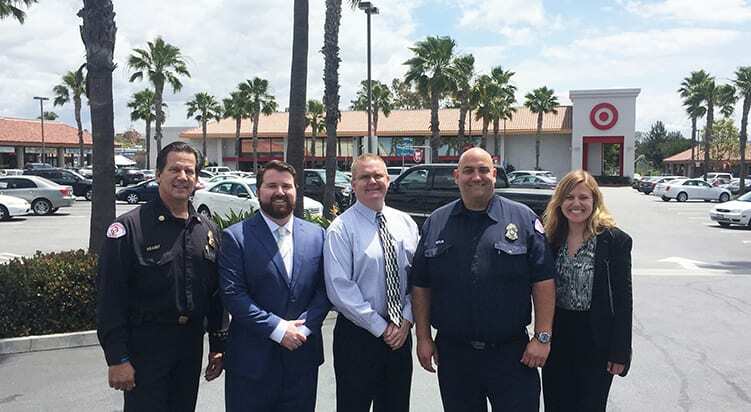 Members of the Long Beach Fire Department and Long Beach Police Officers Association gather in front of Bixby Village Plaza to receive donation from Westar Associates. LONG BEACH, CA (May 2016) – On May 25, 2016, Westar Associates made a charitable donation to the Long Beach Police Officers Memorial Widows Emergency and Scholarship Fund and the Friends of Long Beach Firefighters organizations to show their ongoing support for the city of Long Beach. The Friends of Long Beach Firefighters organization plans to use their donation to enhance the growth of the Long Beach Fire Department’s philanthropic programs, such as the Long Beach Fire Ambassadors, the Spark of Love Toy Drive, Junior Guards, Search and Rescue Canine, and more. For 15 years, Westar Associates has managed and operated Bixby Village Plaza, located on Bellflower Blvd. and Pacific Coast Highway, right across the street from the VA Medical Center. The center includes Target, CVS pharmacy, US Bank, and a variety of service uses and eateries. Names of people pictured from left to right: Richard Brandt (Deputy Chief-Fire Marshal, Long Beach Fire Department), Connor Best (Vice President, Westar Associates), Stephen James (President, Long Beach Police Officers Association), Jake Heflin (Firefighter/ Paramedic/ CERT Program Manager/ Public Information Officer/ US&R Medical Specialist, Long Beach Fire Department), and Ally Ellison (Director of Media, Westar Associates).